The Half Torso Kit is designed to make a mold and casting of either the upper or lower torso. Commonly referred to as the Breast Casting Kit or the Belly Bump Kit or the Pregnant Belly Kit, you can choose what part of the body you wish to do. 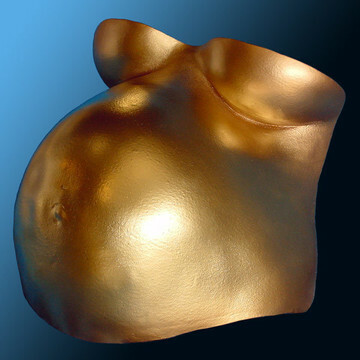 For more coverage, consider our Maternity Torso Casting Kit. The kit is complete with everything you'll need except for some water, some paper towels and a model. 1. Apply a "frame" of plaster bandages around the area you want to mold. The area that can be done is roughly 18 inches square, enough to do either the belly bowl or the chest area. 2. Mix and apply the alginate to the area inside the frame. Make sure the alginate overlaps the plaster bandage frame by about half the width of the frame. 3. Apply an outer shell of plaster bandages on top of the alginate. This is what keeps the flexible alginate rigid so you can pour casting stone into it. Make sure the plaster bandage "shell" is attached to the plaster bandage "frame". This keeps the two from separating as you take the mold off the model. 4. Mix the LiquiStone Gypsum Cement and pour it into the alginate mold. Make sure to pull some up the sides of the mold. 5. In about an hour, the casting can be removed from the mold. Generally, the mold cannot be used again, but in some cases it can. 6. Trim the edges of the casting and sand them smooth if you choose. 7. Apply a finish to the casting if you wish. It can be painted, waxed or varnished. This has a side benefit of keeping the casting clean as skin oils from your hands can get into the surface of an unfinished casting and the stain is very difficult to remove. This Maternity Torso Casting Kit technique is not as hard as it sounds. Our customers tell us that using the kit is much easier than purchasing the bulk materials and "winging it", at least for the first attempt. Once you learn this technique, we recommend that you purchase the materials you need in bulk.